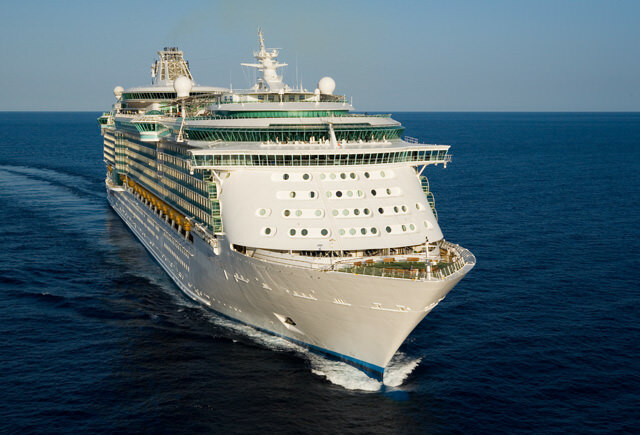 Liberty of the Seas may be huge, but she still boasts a striking profile. Photo courtesy of Royal Caribbean. The second of the Freedom-class ships, the 160,000-ton, 3,634-guest Liberty debuted in 2007 and, like her older sister, is essentially a beefed-up version of Royal Caribbean’s earlier Voyager-class vessels, offering everything those ships are famous for, plus several additional entertainment, sports, and shopping features. Liberty’s main drag is the Royal Promenade, a four-story horizontal atrium that stretches 445 feet down the ship’s center and is designed to resemble famous American entertainment streets like New Orleans’s Bourbon Street or Memphis’s Beale Street. Along its length, there’s an elegant champagne bar; a Ben & Jerry’s ice-cream shop; a 24-hour cafe; a pizzeria; six different shops; a comfortable English-style pub with seating inside or on the promenade itself; the cute little Cupcake Cupboard, serving fresh cupcakes at a la carte prices; and a Napa-style wine bar that offers wine-appreciation classes, tastings, and a chance to try dozens of vintages. Toward the bow, the Sphinx show lounge offers live music, dancing, and entertainment. Most guests end up spending a lot of time in or passing through the Royal promenade, either passing through when heading from one part of the vessel to another; hanging out to socialize; popping down briefly to grab a snack or coffee; catching an evening performance by one of the ship’s bands; or coming for the parades created in collaboration with DreamWorks Animation, in which stilt walkers and acrobats mix it up with Dreamworks characters like Shrek, the Madagascar penguins, and Po the Kung Fu Panda. You can even sleep in the Promenade if you want to, sort of: Up above, 174 cabins face the scene, their windows giving you views of the “street life” below. Curtains and soundproofing help shut out the light and noise at bedtime. 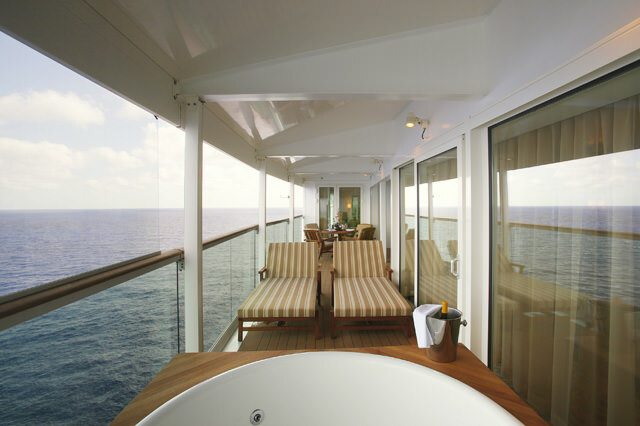 The Royal Suite aboard Liberty of the Seas may be worth the price of admission for the balcony alone. Photo courtesy of Royal Caribbean. The Flowrider aboard Liberty of the Seas. Photo courtesy of Royal Caribbean. 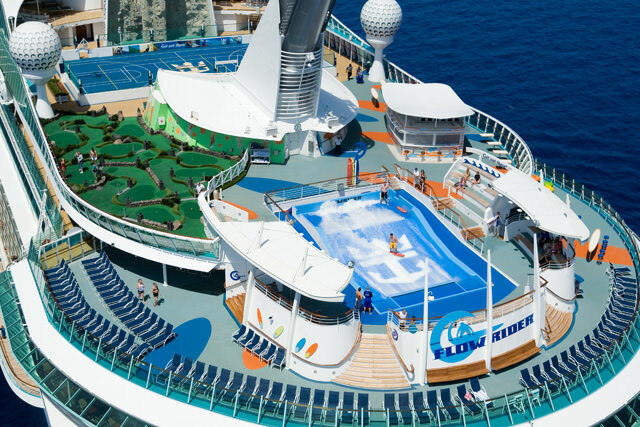 Deck 11 offers a number of different fun-in-the-sun experiences. Toward the stern, nearly half the outdoor pool deck is taken up by the H2O Zone Water Park, where kids can soak each other with water jets, buckets, and sprays hidden among the cartoon statues. There are also two wading pools (one for toddlers) and two adult-friendly hot tubs. Farther forward, the enormous, multi-tiered main pool deck has two semicircular pools bisected by a walkway and platform, several whirlpool tubs, and scores of deck chairs. A giant, 18½-foot video screen overlooks the pool area, showing movies and entertainment programs throughout each cruise. Other notable spaces on board include while the beautiful, three-story Platinum Theatre; a two-level disco called The Catacombs; the huge Casino Royale; the Boleros Latin-themed lounge and nightclub; the elegant Viking Crown Lounge; and the cool Olive or Twist jazz club and martini lounge. For kids, the large Adventure Ocean center on Deck 12 offers activities for different age groups, while characters from Dreamworks films make appearances at special breakfasts, photo ops, and other kids’ activities. Next door to the kids’ center, there’s a sizeable arcade, the Fuel teen disco, and a teen chill-out space called the Living Room. There’s also a nursery for babies and tots 6 through 36 months, offering playgroups and activities developed in partnerships with Fisher Price and Crayola.